For Farmers Ending Hunger, 2013 was the best year to date. It’s the seventh year I’ve been with Farmers Ending Hunger, and we received 2.5 million pounds in donated food products from Oregon farmers and ranchers. We’ve come a long way since that first donation of 173,000 pounds of frozen peas in November 2006. Now, we receive a variety of fresh and processed food products every year. It’s locally grown in Oregon and all high quality. We coordinate with Oregon Food Bank to ensure we target products they want to put into a food box. For me, the interesting part is what needs to happen before a product is turned into the right form for a food box. Much of what we receive, such as potatoes and onions, doesn’t require further processing or much packaging. However, many products we receive require some handling before they can feed hungry folks. For example, take pancake mix. Our mix starts with wheat donations from our farmers. It takes about 4,500 bushels for each 200,000 lb. batch we deliver each year to Oregon Food Bank. That’s about 230,000 lbs. of milled wheat! We have farmers who donate 100, 500 and even 1,000 bushels of wheat in a given year. We also partner with the Oregon Wheat Foundation and their “Bushels for Betsy” program, which provides about half the wheat needed. The process starts at Pendleton Flour Mills to blend the correct varieties and mix of wheat for our secret flour blend. Then, our pancake mix flour is transported to Kent, WA, where Continental Mills adds the perfect ingredients and package the mix into three-pound bags for us. At this point, Oregon Food Bank sends trucks to Kent for the bagged pancake mix. The beauty of our pancake mix is that it is shelf stable. You only need to add water to make pancakes. It’s a versatile mix and can be used for biscuits, muffins and dumplings. The food banks tell me their clients really like it. 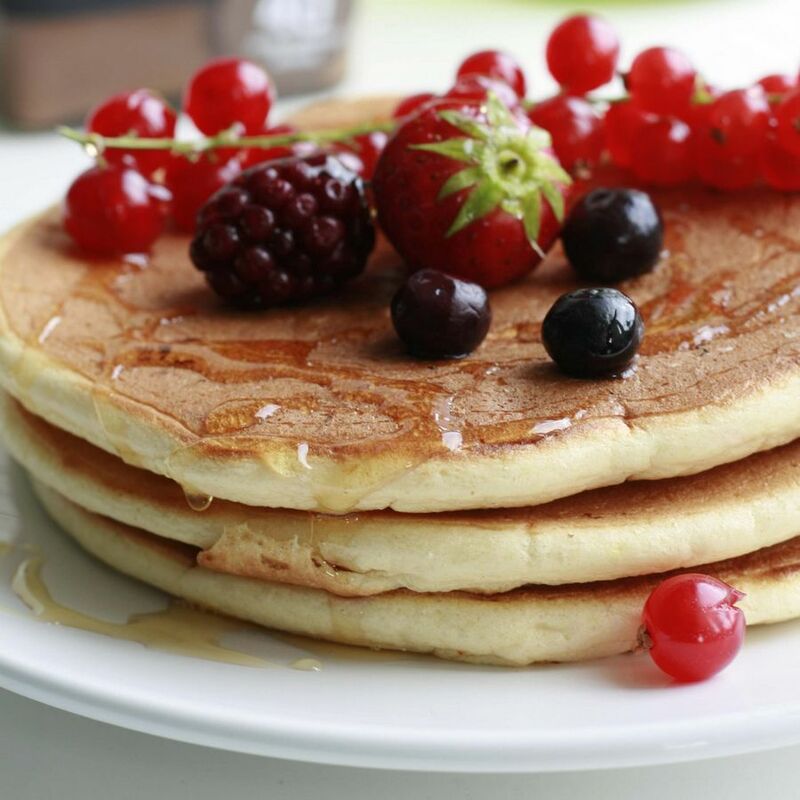 And yes, you could say that pancakes are empty calories, not the highly desired and recommended fruits, vegetables and protein we would like to have in a food box. But, hungry people need calories as much as any nutrient and pancakes can be a real treat once in awhile. The process for other products can also be complex. The cattle we make into hamburger are processed in Woodland, WA, and then finished in Clackamas, OR. Cattle donated in Malhuer and Grant counties are processed in Nampa, ID, and Prineville, OR. It may seem like we go through a lot of steps, but these are the regular channels of production followed by commercial agriculture. We try to work within the established routes and not ask for any special or out-of-the-way handling. As you might expect, we need many partners to get this all done. Obviously, we could not do what we do without Oregon Food Bank. Our private partners, such as Pendleton Flour Mills and Continental Mills, are equally important. And, not the least of our partners is you, our donors and supporters. Thank you! Portland, Ore. – August 13, 2013 – A hovering helicopter dropped 900 numbered golf balls onto the Chehalem Glenn driving range last week for the Golf Ball Drop sponsored by the Agri-Business Council of Oregon. For the third year, donors purchased one or more golf balls for a chance to win two round-trip airline tickets on Southwest Airlines. The Golf Ball Drop fundraiser supports the work of two Oregon non-profits hoping to raise awareness of Oregon’s agricultural community. The Agri-Business Council of Oregon and its Adopt a Farmer program introduces middle school students to agriculture and the important contributions of farmers. Farmers Ending Hunger works with Oregon farmers who donate a portion of their crops to help feed Oregon’s hungry. Its Adopt-an-Acre program raises money to transport and process the fresh ingredients for use in emergency food boxes. 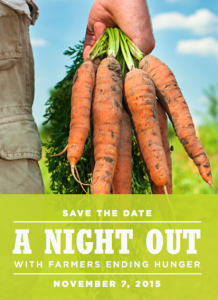 “We were thrilled to be included in this year’s fundraiser and share the work our farmers are doing on behalf of so many children and families struggling with hunger, “ said John Burt, executive director of Farmers Ending Hunger. This private, non-profit volunteer membership organization founded in 1966, preserves and enhances the vitality of Oregon agriculture. 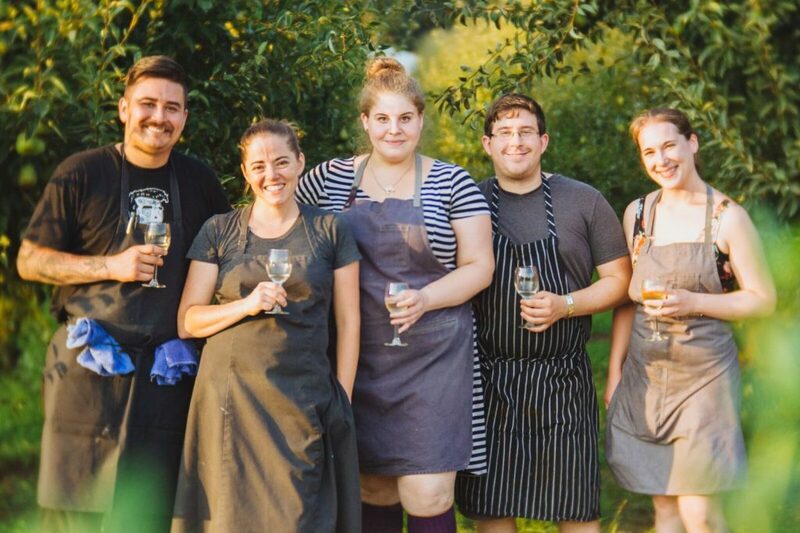 The Adopt a Farmer program launched in 2011-2012 in three Beaverton School District middle schools and allows students to connect with an Oregon farmer for an entire school year to experience life on a farm. The Agri-Business Council hopes to expand this program into more middle schools in Albany, Beaverton, Eugene, Salem and Silverton to reach more than 1,200 students. For more information, please visit www.aglink.org. Eastern Oregon resident Fred Ziari created the non-profit Farmers Ending Hunger in 2004 when he learned that Oregon was one of the hungriest states in the country. Farmers Ending Hunger gathers Oregon’s agricultural resources to help feed the hungry. 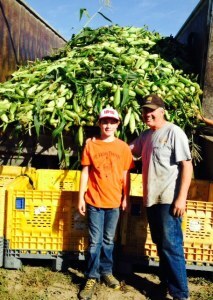 Local family farmers, ranchers and growers donate a portion of the food crops they raise. Adopt-an-Acre, a supplementary program seeks the operating funds necessary to harvest and process those same crops into frozen and canned food products that are easily stored and utilized and distributed to the hungry through Oregon Food Bank’s regional network. For information on how to contribute to Adopt-an-Acre, please visit www.farmersendinghunger.com or call Executive Director John Burt at 503-931-9232. Follow us on Facebook at Farmers Ending Hunger for news and events. SALEM, Ore. (July 19, 2013) — Farmers Ending Hunger — an organization that delivers high-quality food to Oregon communities through a partnership of farmers, processors, the Oregon Food Bank, and the public – has received a donation of $5,000 from CoBank on behalf of Erik “Rick” Jacobson, a member of the cooperative bank’s Board of Directors. Farmers Ending Hunger was founded in 2005 to help eliminate hunger in Oregon, where one in five people rely on food stamps. Many of the state’s farmers and ranchers donate a portion of their harvest each year to help the cause. Some of the produce is processed then packaged, while some is delivered fresh to Oregon Food Bank, which distributes the food throughout the state to the people who need it most. The organization is one of the biggest contributors to the food bank and hunger relief in the state. Ranchers and farmers have donated about 2 million pounds of harvested goods annually to the effort. The organization hopes to double that in the near future. CoBank’s Jacobson is the retired president and chief executive officer of NORPAC Foods, Inc., an international fruit and vegetable processing and marketing cooperative. He lives in Bend, Oregon, and operates RG Solutions, LLC, a consulting firm. He previously served as a director for Food Alliance, a sustainability certification organization, and Oregonians for Food and Shelter, a farm and forestry legislative advocacy organization. Jacobson is now serving as general manager for Pendleton Grain Growers in Pendleton, Oregon. The Oregon Wheat League, which is a major contributor to Farmers Ending Hunger, is made up of many members from Pendleton Grain Growers. The contribution is part of CoBank’s corporate giving program, which allows employees and board members to direct bank donations to their choice of non-profit organizations and programs. Through the program, CoBank donated more than $1.2 million last year to benefit local communities where its employees and directors live and work. CoBank is a $95 billion cooperative bank serving vital industries across rural America. The bank provides loans, leases, export financing and other financial services to agribusinesses and rural power, water and communications providers in all 50 states. The bank also provides wholesale loans and other financial services to affiliated Farm Credit associations serving approximately 70,000 farmers, ranchers and other rural borrowers in 23 states around the country. SALEM, Ore., Feb. 2, 2012 – Farmers Ending Hunger today received a $25,000 contribution to support its Farm to Food Box program. The grant – which was given to the nonprofit organization through the Walmart Foundation’s State Giving Program – will supplement the organization’s efforts to collect and transport nearly 2 million pounds of crops and meats annually from statewide farms to processors, and then to the Oregon Food Bank Network. Farmers Ending Hunger works to eliminate hunger throughout the state by increasing the amount of high-quality food available to local communities through a partnership with local farmers and ranchers, who donate a portion of their harvest, as well as food processors, the Oregon Food Bank and the public. Farmers Ending Hunger will use the Walmart Foundation’s grant to supplement the additional costs associated with product assemblage and distribution. In total, the grant helped to sort, process, package, store and transport 175,000 pounds of pancake mix and 4,000 pounds of hamburger to the Oregon Food Bank to be distributed and served in food boxes for hungry Oregonians. One million food boxes were delivered last year. 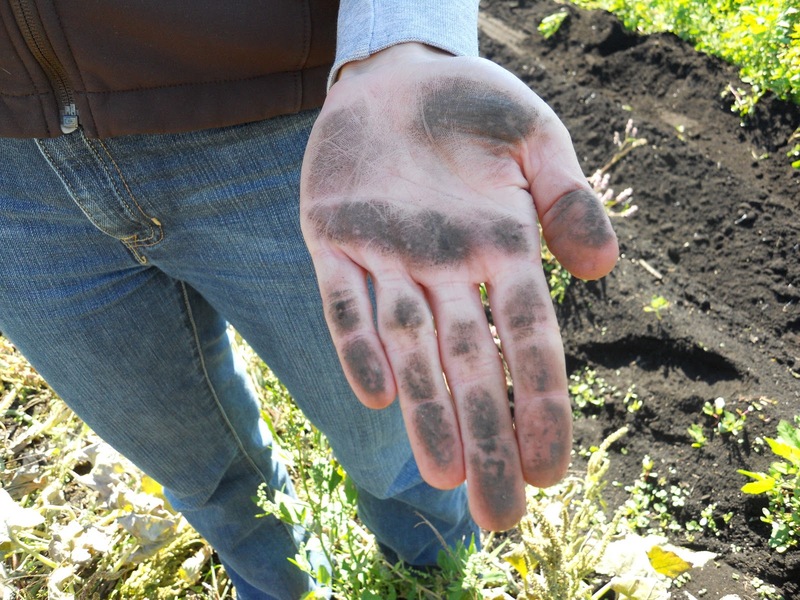 The contribution to Farmers Ending Hunger was made possible through the Walmart Foundation’s Oregon State Giving Program. Through this program, the Walmart Foundation supports organizations that create opportunities so people can live better. The Walmart Foundation State Giving Program strives to award grants that have a long-lasting, positive impact on communities across the U.S. In 2010, Walmart and the Walmart Foundation awarded more than $11.3 million to local organizations in Oregon. Through additional funds donated by customers, and Walmart and Sam’s Club associates throughout the state, the retailer’s contributions in Oregon totaled more than $11.8 million. To be considered for support, prospective grantee organizations must submit applications through the Walmart Foundation State Giving Program’s online grant application. Applicants must have a current 501(c)(3) tax-exempt status in order to meet the program’s minimum eligibility criteria. Additional information about the program’s funding guidelines and application process is available online at www.walmartfoundation.org/stategiving <http://www.walmartfoundation.org/stategiving> . Walmart and the Walmart Foundation are proud to support initiatives that are helping people live better around the globe. In May 2010, Walmart and its Foundation made a historic pledge of $2 billion cash and in-kind support through 2015 to fight hunger in the U.S. The Walmart Foundation also supports education, workforce development, environmental sustainability, and health and wellness initiatives. To learn more, visit www.walmartfoundation.org <http://www.walmartfoundation.org> . Eastern Oregon resident Fred Ziari created the nonprofit Farmers Ending Hunger in 2004 when he learned that Oregon was one of the hungriest states in the country. Farmers Ending Hunger gathers Oregon’s agricultural resources to help feed the hungry. Local family farmers and ranchers donate a portion of the food commodities they raise, and Adopt-an-Acre, a supplementary program seeks the operating funds from the public necessary to harvest and process those same crops into frozen and canned food products that are easily stored and utilized, then distribute them to the hungry through Oregon Food Bank’s regional network. For information on how to contribute to Adopt-an-Acre, please visit www.farmersendinghunger.com <http://www.farmersendinghunger.com/> or call Executive Director John Burt at 503-931-9232. Follow us on Facebook at Farmers Ending Hunger for news and events.